I’ve not been around here for some time. I have been working hard though. I have lots to tell you about (just not quite yet… not long). One thing I can talk about is the latest release from CRAIG DILOUIE. THE FRONT: BERLIN OR BUST is the third part in the World War II zombie series written by Timothy W. Long, Craig and myself. It’s available now from Amazon, and I thoroughly recommend it. An airborne operation of German, American, and British paratroopers drop on Berlin in this exciting new episode in the WW2 zombie series, THE FRONT! While the Battle of the Bulge turns into a bloodbath due to the introduction of a serum designed to create super soldiers but creating flesh-eating zombies, a German paratrooper unit rests in Genoa, Italy after years of hard warfare. They celebrate an announced armistice hours before flying to England to learn the truth: Germany has collapsed due to the spread of these monsters, and they must work with their former enemies to drop on Berlin and recover a pure sample of the Overman serum. What follows is an inside look at how the elite German paratroopers fought and their bloody homeward mission to recover the Overman serum before all Europe falls. My friend CRAIG DILOUIE released a new book earlier this month. Craig and I go a long way back and I consider him one of the most interesting voices in genre fiction. You can read my thoughts on his earlier releases TOOTH AND NAIL and SUFFER THE CHILDREN in the archives of this site. What I love about his work is the way he’ll take an extraordinary premise and write about it in a detached yet personal way which pulls no punches. He takes world-changing events like the military response to a fast moving zombie infection or a virulent strain of vampirism which affects only children, and looks at them in a whole new light, often making them feel uncomfortably plausible. His latest release ONE OF US (out now from Orbit) is no exception. It takes the well-used set-up of mutant kids born with special powers, but instead of going down the tired and cliched X-Men superhero route, he instead tells a much darker and altogether more disturbing story of neglect, distrust and hatred. The story of a lost generation, and a boy who just wants to be one of us. I thoroughly enjoyed ONE OF US. Set in Georgia in an alternate 1984, it’s a fascinating read. As you’d expect, the grotesques aren’t the real monsters here, rather it’s DiLouie’s cast of prejudiced, cruel, moralistic non-mutants. For me, what sets this story apart is the masterstroke of having the deformed and mutated kids being born as the result of a new strain of sexually transmitted disease. Because this is a generational shift, it allows DiLouie to present us with a cast of ‘special’ kids who grow up together and who therefore both lose their innocence and mature/gain their powers at the same time. This effectively amplifies the problem facing the backward facing society from which the children have been ostracised, and you get the sense from the very beginning of the book that once these kids are fully in control of their destinies, things will never be the same again. Highly recommended. But ONE OF US isn’t the only Craig DiLouie release I want to tell you about. 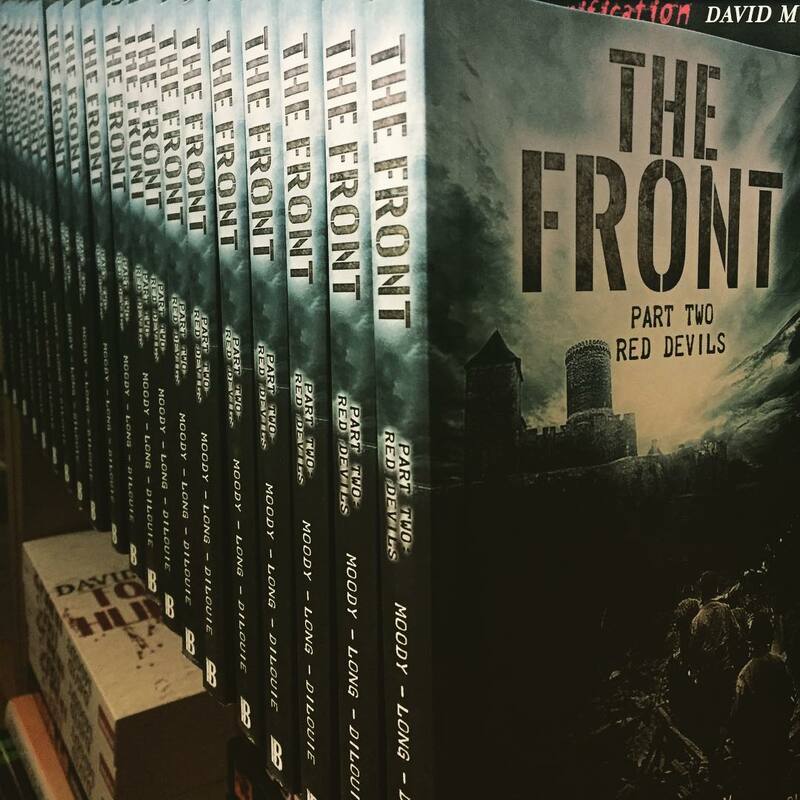 I’m also very excited to announce that his entry in THE FRONT series – following SCREAMING EAGLES by Tim Long and my novel RED DEVILS – will be released on 31 August. I’ve had the pleasure of reading an advance copy of the book and it definitely doesn’t disappoint. BERLIN OR BUST is a cracking tale which takes us right into the rotting black heart of the undead Nazi war machine. You can pre-order it now. Very happy to be able to let you know that THE FRONT: RED DEVILS is now available as an audiobook. You can snag a copy now on Amazon, Audible and iTunes. Todd Menesses, who also narrated book one in the series, has done a grand job.
. New to audiobooks? Try Audible and get two free audiobooks. being downloaded between 2001 and 2008 when the series was acquired by Thomas Dunne Books. has been a godsend on many recent plane and train trips. STRAIGHT TO YOU is FREE from Smashwords for the whole week! TRUST is FREE from Smashwords for the whole week! (which was released this week, in case I hadn’t mentioned). Much of the second half of the book is set in the fictional surrounds of a concentration camp at Polonezköy, Poland. I had a very clear image in my head of how parts of the camp would look, and that got me thinking about a long-forgotten horror movie I’d always planned to watch but hadn’t been able to locate. That movie was MICHAEL MANN’S THE KEEP. Whilst not a great film by any stretch of the imagination, I certainly enjoyed it enough to recommend it to you here. officially hits the shelves. Paperback and ebook editions are available now. Signed copies are in (as you can see from the image below) and they’ll be winging their way around the world imminently. You can pick up a signed copy from www.infectedbooks.co.uk. , is officially out next week in both paperback and ebook editions. As requested, signed copies are available to order from www.infectedbooks.co.uk today. The signed paperbacks cost £9.00 and will be shipping late next week. If you read my last post you’ll know about my ebook philosophy. In keeping with that post, you’ll be pleased to hear that if you order the book you can immediately download your complimentary ebook version and start reading straightaway. And if that wasn’t enough, there’s free shipping for UK readers (I’m sorry… economics prevents me from extending that offer worldwide). should be right up your street! I hope you have as much fun reading as I did writing it. I was sorry to hear that SHELFIE closed down last week. You might remember me posting about the service a couple of years ago, back when the company was known as BitLit. The premise, I thought, was brilliant: you took a photo of your bookshelf with your phone and the Shelfie app scanned the spines and gave you links to download free or discounted ebook copies of the titles you already owned. I immediately made all Infected Books titles available via the service, because it seemed to fit perfectly with my ethos that a reader should only ever have to buy the same book once, and if you buy a paperback, the ebook version should come bundled (because you can rip a CD and get mp3s for your phone, but you can’t buy a paperback and rip the text for your Kindle, can you?). will also be a part of the IB print/ebook deal).